One of my favorite public art installations in Seattle is the series of 11 Chinese dragons twisting and turning their way across light poles in Chinatown’s International District. Under the direction of chief designer Martin Brunt it took a team of sculptors, painters, boat builders and a feng shui expert two years to complete the 300 lb dragons and though the intricate details and carefully pained scales look delicate they are designed to withstand winds up to 90 mph. This is my 4th image for the Black & White 5 Day Challenge and is posted as part of the Weekly Photo Challenge: Scale. I like it, too, Lisa, but I’d love to see it in color. Looks good in B&W, though. I want to go back and get some good color images soon, Janet. I’ll be sure to share them here! When did they instal these? I don’t recall seeing them last time I was there. They went up during the summer of 2002 but are spread across the district so it’s possible to miss them during a visit. Wow, spectacular! I’ll have to check these beauties out! very awesome! love this:-) chinatown has the unique asian arts of course. With the high winds associated with the weather systems moving into the Northwest this weekend… that was great planning. Yes it was, Jane. 🙂 What a blustery winter weekend we’re having. Great! What colours are they in? Love dragons. Thank you, Amy. Each one is in a different pose and a lot of fun to study as you walk down the street. He does look pretty calm, Patrick. You weren’t kidding 😀 A great initiative and I am sure it brightened up the neighbourhood. Super cool angle to shoot it, Lisa! The District wanted a way to call attention to their area in a busy part of the city and these dragons have been great markers. I’m glad you like this shot, Paula! This is my favorite by far! Bravo!! The pigeon doesn’t even look worried! It was a great photograph really. Frameable. If you saw the horrible photos that hang in hotels here! I always wonder how to crack that market. If you figure out a way in let me know. 😉 Hotel room photos can be so awful! I would LOVE TOO!! I will ask my son. Work such as yours would fit in any Asian Hotel in the world. Whimsical and worldly and arty. The place I was in last week had amateur macro photos of rain drops on leaves in every room , hallway and lobby. They were really poor. How did this petdon luck out is the question? Some people just manage to be in the right place at the right time is all I can figure. 🙂 Thanks for your nice comments though! 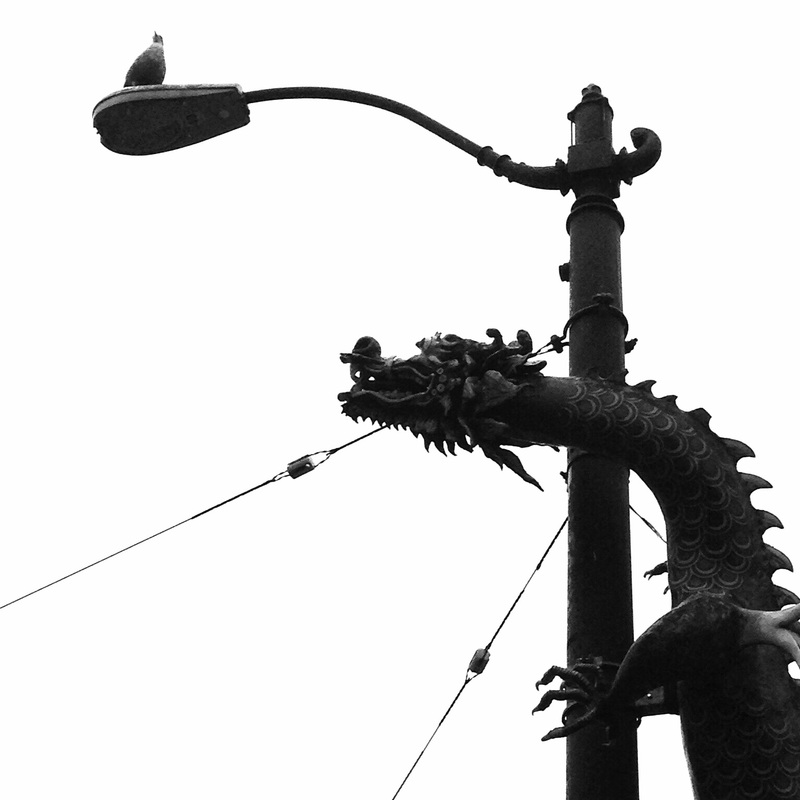 I love the dragon and the way you shot this, but the thing that caught my eye was the bird on top of the light. Great – especially w the bird! Brilliant the way the bird and lamp mimic the dragon.